Showing results for tags 'clown fish'. 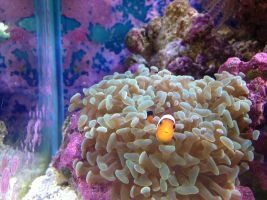 After my long tentacle anemone took a turn for the worse last year, my pair of clown fish began hosting with the hammer coral I had in the tank. Both, the clown fish and the hammer coral seem to be happy.